A few months ago, my baby sister and I spent the day shopping and we ate at The Granola Bar. I ordered, what they call, a Buddha bowl. 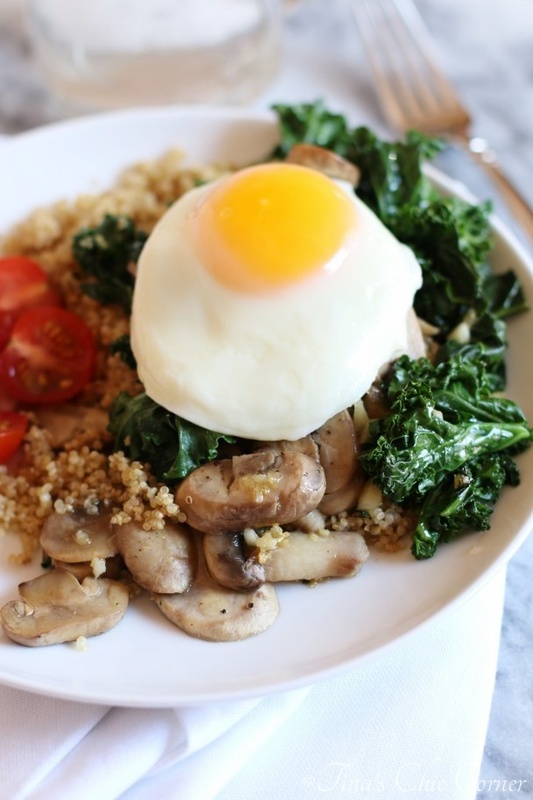 It’s warm quinoa topped with an egg and a side of sautéed kale and mushrooms, fresh sliced tomatoes, and avocado. It was fantastically delicious. Of course the food blogger in me wanted to re-create the meal at home so this recipe is my version of it. Aside from the basic ingredients that I mentioned, I was left wondering how exactly did they make it all taste so darn good? 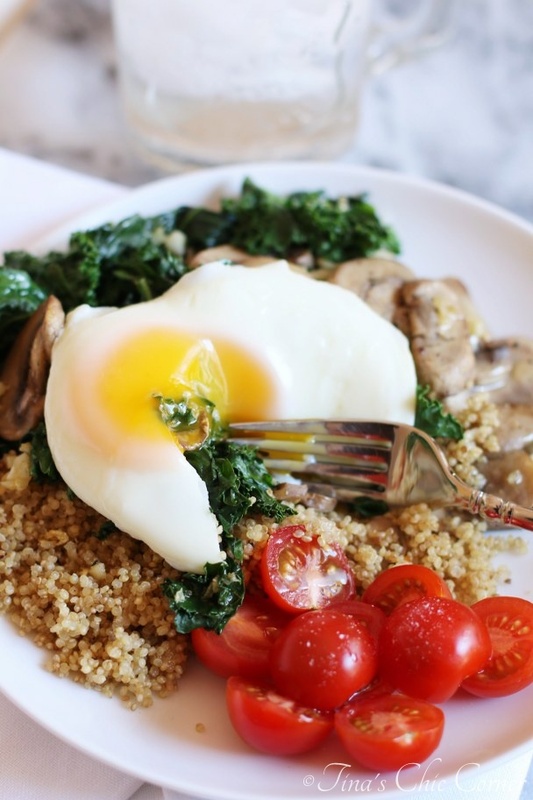 What magical sauce did they use to sauté the mushrooms and kale? I decided to try not to over analyze it and to just go with the flow (who am I?) so I opted for a butter garlic dressing. I figure you can’t go wrong with butter because it’s butter and it’s delicious. You’ll notice that the avocado is missing, which is a shame because I love the stuff. The last three avocados that I bought skipped the delicious phase somehow and went from being hard to gross directly. That meant they had no place in this dish, and it may also mean that a cold house in New England during Autumn is not a good place for avocados to ripen properly. My shortcomings aside, I definitely recommend the addition if you can get your hands on a good one. By the way, The Granola Bar has other fabulous things on their menu. Obviously this is only a recommendation if you are local to the area. They have fantastic hazelnut granola bars, you know, at The Granola Bar… get it? It only makes sense that they are the bomb dot com. They also have an awesome avocado grilled cheese sandwich. It’s truly as amazing as it sounds. Next time I have a good avocado (which could be several months from now) I must try that at home. Bread, cheese, avocado, butter. Done deal. Almost no redeeming qualities at all. Perfect comfort food. Cook the quinoa according to the directions on the package and set it aside. While the quinoa is cooking, in a medium saucepan add the oil and heat it on medium heat. Add the sliced mushrooms and cook them until they are tender. Add the chopped kale and cook until the kale leaves are tender. When the mushrooms and kale are done cooking, remove them from the pan and set them aside. In the same saucepan (keeping it on medium heat), add the butter and melt it, stirring occasionally. As the butter melts it will look bubbly and look like it’s boiling. Add the minced garlic and keep stirring occasionally. The color of the butter will change from a yellow to light brown. Once you achieve that, turn off the heat and remove the pan from the heat. Add the mushrooms and kale back into saucepan and mix everything together. Set this aside. In a separate saucepan cook the eggs. You can really cook them however you like, but if you want to achieve the same way my eggs look then click HERE for those directions. 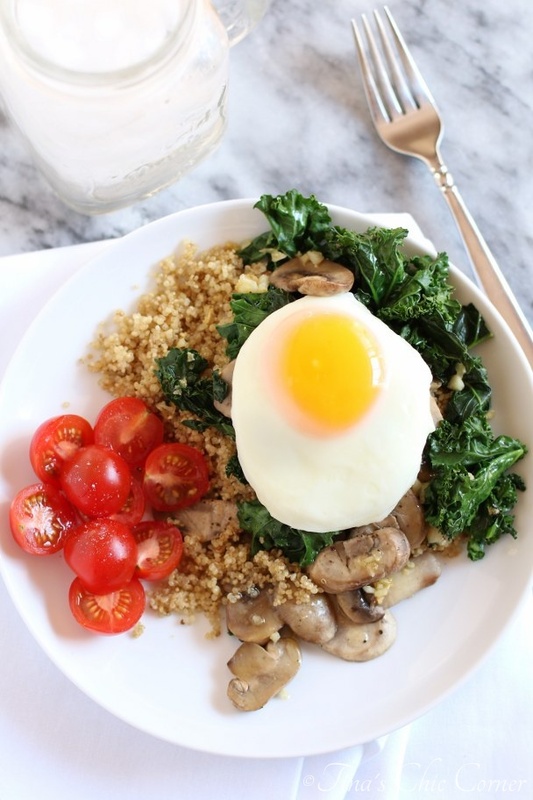 To assemble each plate, spoon the cooked quinoa onto a serving plate, then top with the kale and mushroom mixture, then place the cooked egg on top. Place the sliced tomatoes on the side.